The time: well over a decade ago. I was interviewing Tim Rastetter, former brewer at BrewWorks, a recently deceased brewpub in Covington, KY. I was also discussing beer with Fred Karm, the master brewer at the time for all the Thirsty Dog Brewpubs in Akron, Canton and just south of Dayton, Ohio. I had also just visited Burkhardt Brewing just south of Akron. This was the location of their brewpub, started after the demise of their much bigger brewery that thrived during the days when Utica Club and Gerst also had big breweries that sold local. Many of these breweries died when the giants in the biz: A/B and Miller outsold what was mostly a one product market. The differences between these various beers were often minimal compare with the distant past and the micro/brewpub boom of the past 20 years. I was also about to switch from writing under my not so secret identity and change my column to: The Brew Biz, written under my own name. I still use my “secret identity,” but for other purposes. What was it? Shhh! It’s a secret! Besides, I got tired of searching for a phone booth where I can change into that super elderly curmudgeon just so I could write about beer. A lot has changed since Burkhardt was a large brewery. A lot has changed since Thirsty was a brewpub. 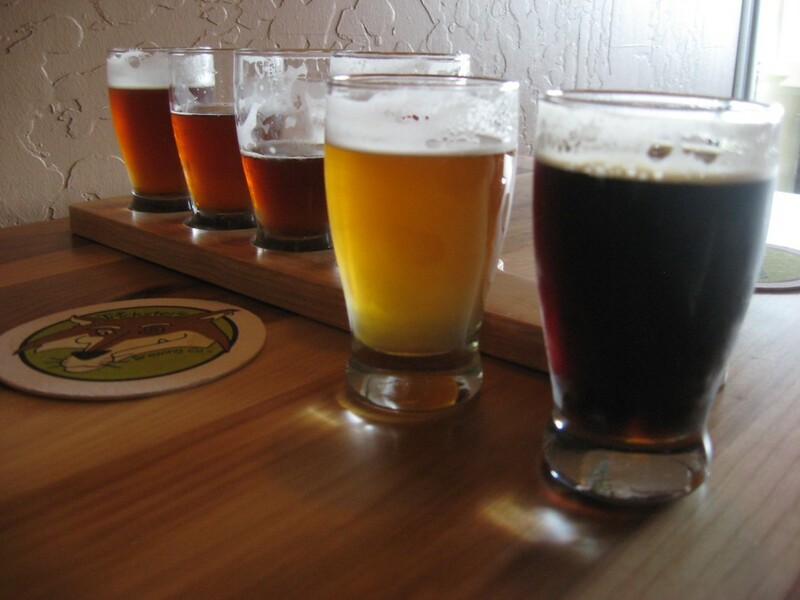 Many smaller breweries and then many brewpubs have gone dark. While I was a little young for the big brewery die off, I have visited many a brewpub that went dark… and I had assumed Thirsty was one of them… though curiously I saw an occasional bottle as I passed through the area on a yearly basis. Maybe because it started with me visiting various locations and at the south of Dayton location I noticed the brewing equipment had seemingly walked out the door. Apparently Miami Trail Brewery was the first location that helped kept the brand alive. Later they vended out to Frederick Brewing in Maryland. Then, the next time through, I noticed the Canton location was closed. My last “contact,” if you wish to call it that, was Akron where hazmat-like signs were up on the doors and windows. I asked Tim about those and he had no idea. In 2003 a group of investors bought the recipes and the rights. Everything had to be sold. They kept the brand alive by having it brewed “elsewhere,” until they the purchased the old Burkhardt Brewery building in 2006. After getting it ready they brewed their first batch in 2007. Tim: graying hair with black still peeking out here and there, prominent ears and a slight lift to the lips leaving a perpetual smile, is a busy man. He obviously has quite the handle on many aspects to the operation and from phone calls, to a buzzing door, to deliveries, to merchandise requests… life can come fast even on what should have been a lazy Wednesday afternoon. The recipes for Thirsty have been changed somewhat. “I noticed the old recipes had a big body theme. We’re not a brewpub anymore. We need to appeal to a wider taste… not be so one-dimensional.” I understand. As an entertainer by trade the “audience” is all important in brewing, just like it is on stage. Market is crucial. There are 15 beers in the Thirsty line. As a companion piece to this column you will find a review of four of them. I must admit I was very impressed with Siberian Nights, their Russian Imperial. Unlike the rather unremarkable Russian Imperial I had at the brewpub years ago this was rather distinct with deep, dark grain sense that; like Fred Karm’s old ESB, seemed to unfold… only grain-wise rather than hops. Though just a little less “imperial” than many Imperials these days, it was incredible. I want more. And more. One of the changes is Siberian is now unfiltered. Tim said that they simply run the Siberian out of the bottom of the conical until it runs yeast free. Yes, there will still be yeast in the beer; but especially in the darkest of beers. I agree; as Tim added, especially in the darker beers. Tim told a story about a festival where he and Ray Daniels noticed a booth where they had the same wert over and over with different yeasts applied for fermentation. The taste difference was remarkable, of course, but Tim noticed that it confirmed his suspicion: different yeasts had affected color. According to Tim that was a bit unsettling to Ray who had published a book claiming just grain decided color. That’s sad, because I remember Tim doing IBUs well over 100 in the 90s at BrewWorks, a now defunct brewpub in Covington, KY… barely south of Cinci. I really do miss his super hop soups. Yet I think he probably feels a bit more free here than his last job. Between BrewWorks and Thirsty he worked as the third brewer at Hofbrauhaus, also in Covington. To my taste buds, when Millie and I had our anniversary dinner there a few years ago, they brewed four versions of pretty much the same damn thing. And the food? Well, let’s just say I’ve had really good sauerbraten. This was unmarinated meat. The beer, while well done to German brewing standards, was mundane because there was so little variation. The Thirsty Dog has been growning thirsty indeed. Sorry I ignored you pup. They have a tasting room in the works where they will also pour growlers. Tim told me that not only will they offer their own fare’, but other Ohio breweries… and Belgian. They also have two hand pumps. When it’s up I know I’ll stop by. Sounds like fun. I had a sample of their Christmas Ale: 12 Dogs of Christmas. It reminded me of the eggnog spice-laced Christmas ale at McGuires: only better… more body and a bit backed off spice-wise. Tim said he brewed two batches the first year. They got such good response they brewed 29 last year. This year they have 55 planned: all already spoken for by one distributor. No matter how impressed I am with the sample I was offered the sales alone explain how good this beer is. I wrote the first version of this review and interview at a bar in Louisville, KY: Bluegrass Brewpub, where Tim consulted for a while. When you pass through Ohio and Kentucky it’s hard not to pass by a brew establishment that Tim either hasn’t worked at, consulted for or had some influence on. Even Fred Karm, who was the Thirsty masterbrewer over all the former brewpubs, tutored under Tim when he was the brewer at Liberty in Akron. Ohio-tucky should be damn glad that Mr. and Mrs. Rastetter gave birth to a Tim. The Brew Biz: Werts and All, is a column dedicated to review, discuss and comment on all things beer including, but not limited to: marketing, homebrewing and homebrew/beer related events, how society perceives all things beer, reviews of beer related businesses, opinions about trends in the beer business, and all the various homebrew, judging and organizations related to beer.